Every once in a while, something will strike such a perfect chord with me that it's as if The Universe just WANTS me to be happy. And that's how I felt when I saw this flier for Rum Dood, Barkeeper, and Kraken Rum's 'Twas the Punch Before Christmas contest at Malo Cantina. It was just an equation for success! A great drinkin' blog, a great bar shop, my favorite dark rum I hadn't had yet, all under one roof at one of my local haunts. Sign me up! For the contest, Rum Dood had posted the rules, to concoct an original recipe containing citrus, spice, spirits, sugar, and some sort of “weak.” The six selected finalists were mixing up large batches for this event at Malo. And I had a ticket. It was a particularly blustery night when two of my friends and I huddled together, walking through the rain-tinged wind to Malo. 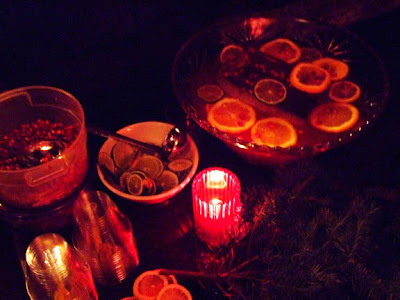 Once in the toasty upstairs, it felt as if the holidays were finally upon us; a warm and lively scene highlighted by laughter and the sound of pouring punch. 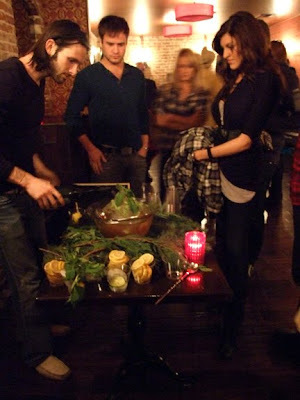 We didn't really waste any time and gravitated first to the station of Zach Patterson from STK. 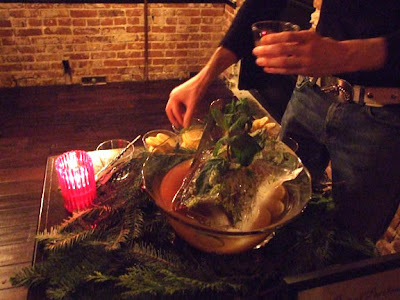 He was serving up a concoction titled "Port of Portland Punch", an iceberg covered with fresh mint and fresher-than-fresh lime zest (he was zesting as we approached) had our mouths watering before we had a glass. This punch was a velvet smooth mixture of Kraken Black Spiced Rum, Canton Ginger Liqueur, Benedictine, Green tea, Lemon, Gum syrup & Tahitian Vanilla/Citrus blend, topped with Prosecco. My palate was excited - and this was only stop #1?? Zach's punch literally made me swoon, the magical blend of Tahitian vanilla and lime mingling like creamy key lime custard, but finishing clean and spicy. Living in LA by way of Portland, OR, naturally we began an instant rapport over the city, the next punch-man down the line chiming in, Mr. Blair Reynolds of Portland tiki culture fame. We slid down to his station and he poured us another slam dunk. 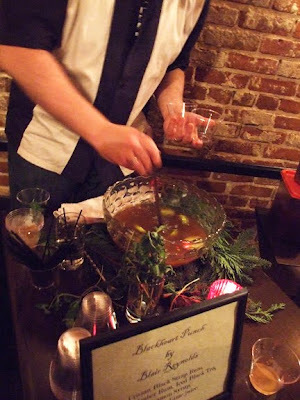 Blair (of Tradertiki.com) called his recipe "Blackheart Punch," a blend of Cruzan Black Strap Rum (my favorite! ), Cruzan Amber Rum, Iced black tea, Cinnamon syrup, Lemon & lime juice. Another popper on the tongue, the cinnamon syrup a superb bond for all of the flavors. I could have stayed in this room all night, back and forth between these two bowls, but then what if they only got better?! 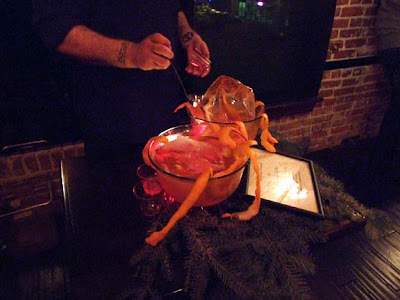 In the next room, Jason Schiffer (from 320 Main in Seal Beach) was topping off his gorgeous "Tonjok Punch" with some bubbly. Already promising, we held out a glass. The curious contents included Bols Genever, Batavia Arrack, Root, Depaz Cane syrup, Simple syrup, Lemon juice, Peychaud's bitters, topped with Chandon Brut. While I was intrigued and impressed with the creativity, the overall effect was quite stiff (as in alchoholic!) and not quite as refined flavorwise as I had hoped for. This was also when we realized we were a wee bit tipsy and visited the snack table! Next we hit Chuck Taggart's "Ponche Relejante" ("Relaxing Punch"). Boy, this was even more intense! Alright, check this out: Gran Centenario Rosangel tequila, Del Maguey Minero Mezcal, fino sherry, Licor 43, Guaycura Liqueur de Damiana, Demerara sugar, Té de 7 Azahares (Mexican “7 Blossoms” tea), lemon & lime juice, Fee’s Whiskey Barrel-Aged bitters, Bittermens Xocolatl Mole bitters (get Chuck's recipe here). 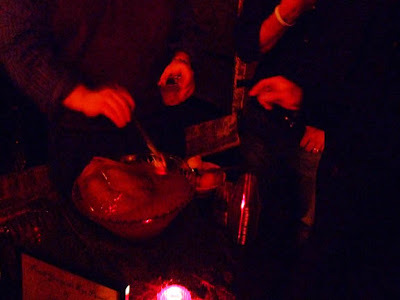 The smoke of the mezcal hit me first, a splash of kerosene in an otherwise smooth floral mixture. His punch was risky with its flavor profile, and I had to give him props for that! But the drunker I was getting on this school night, could not finish my potent glass. By Chris Bostick's (The Varnish) "Punch You in the Eye Punch," I felt like perhaps someone had (even my photography got... fuzzier). This was based around green tea-infused El Tesoro Silver Tequila, with Scarlet Ibis Rum, Aperol, Benedictine, Cucumber Demerara syrup, Lemon & grapefruit juice, topped with Ting Jamaican soda. As much as I wanted to love this (big Varnish fan here), that pesky Aperol took the flavor away from a drinkable punch realm for me. It was a slow sipper, and the pleasure of punch in my opinion is enjoying its potability whilst the tipsy just creeps up! 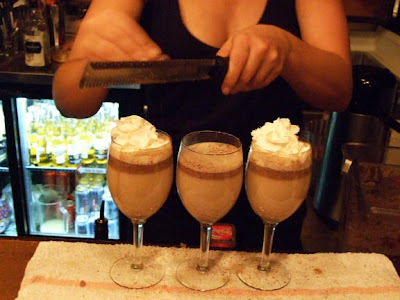 Lastly, a nice lady was mixing up hot buttered Kraken Rums, which at the time sounded lovely, but after a few sips just didn't seem to be the right proportions. Noticing the full glasses about the perimeter of the room, I could see we were not alone in this impression. So back to the beginning we went! 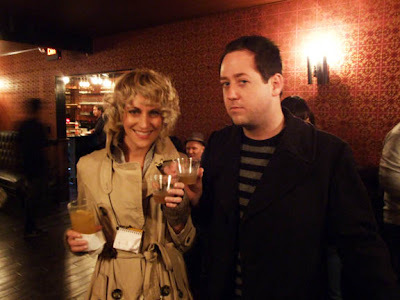 We revisited with Zach and Blair, "reassessing" their pleasant punches before traipsing down the steps with our punch glasses for a quick taco in the dining room. By the time we made it back upstairs, the winners had already been decided (whoops! We hadn't even gotten to vote yet!). Chuck Taggart won the judge's award, while the people picked Zach Patterson. Both well-deserved! A festive night in all, I left happy, and more pleasantly plump than a $12 ticket has ever left me before! Can we do this once a month, guys?? 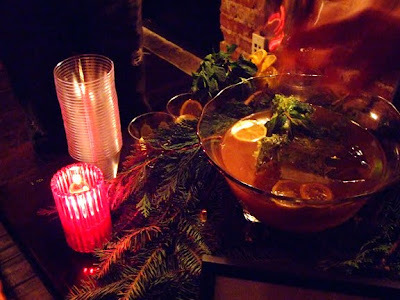 Click here for some more holiday party punch recipes!